Three scenarios are developed for Nepal's future. Each scenario grows from the past, but points to a very different future. Two are more or less unattractive, and one requires a change from the traditional approach to leadership that has characterised Nepal's past. These scenarios are intended to provoke debate. At the same time, readers may wish to challenge themselves to think of cases which are distinct from – and equally probable as – those put forward here. The text is split into three sections. The initial section traces the origins of the present situation, and draws out some possible lessons about the attitudes of Nepalis towards nationhood, government and enterprise. The second section consolidates these thoughts, brings in commentary about the economy and teases out the key variables that will affect Nepal's next generation. Finally, we develop and explore the scenarios. We do not make any specific suggestions, but are ready to work with any group to explore the implications of these scenarios to their activity. These scenarios were produced by SPD (Nepal) in association with the Challenge Network and a group of interested observers. Nepal has the lowest per capita income in Asia. Its difficult physical geography made it immune from the impact colonisation but, as a consequence, has also isolated it from the economic and social impetus of its two enormous neighbours. As a historical refuge from political disruptions elsewhere, many peoples have migrated to it and this, coupled to physical isolation, has made it extremely diverse, both in ethnicity and language. The physical geography also has meant that traditional trade and migration routes have always been North-South, making the concept of an East-West nation a relatively new idea. The natural physical divisions of Nepal have been roughly matched by social disparities. The Northern highlands are innately more isolated, on the whole less wealthy and populated by fragmented groups, often of Tibetan extraction. The South is far better connected, more homogeneous and populated by a population of largely Indian extraction, but faces Bihar, one of India's poorest and least organised states. The North follows Buddhist and animist traditions, whilst the lowlands are chiefly Hindu, with areas being home to Muslim groups. Lowland populations wind up many river valleys into the interior and have settled much of the midlands. They are usually termed "Chettri-Brahmin", after the castes that have the most influence within them. Groups that formerly dominated midland areas, such as the Newari of the Kathmandu valley, have been diluted by immigrant populations. Invasion preserved and often amplified caste and other social differences, and the mixed populations became extremely hierarchical in the centuries leading to national unity. Various warlords, such as the Malla, carved out territories but none of these had lasting impact. The term "Nepal" then applied only to the Kathmandu valley and its surroundings. One such power base lay at Ghorka, from where Prithvi Narayan Shah came to power in the middle of the eighteenth century. He was able to unify the central region of Nepal by a mixture of force and diplomacy, but after his death the country again became unstable. War with the East India company fixed the Southern borders in 1816, and the Shah dynasty remained as figureheads without much power beyond the Kathmandu valley. The Rana family took the effective reins of power after the mid-nineteenth century, ruling from the hereditary office of Prime Minister and Maharaja of Lamjung and Kaski. Treating Nepal as a personal fiefdom, the Ranas ruled until 1950, when they were overthrown by an uprising managed by the emerging middle class and supported by popular movements. The Shah dynasty were confirmed as Kings and, after a protracted period of quasi-constitutional rule, elections were called in 1959. The government was formed by the Nepali Congress, an organisation of predominantly Chettri-Brahmin interests which formed around the figures who had agitated for the removal of the Ranas. This government ran for a year of bickering and indecision, and was dissolved by the King. The panchayat system – a set of local assemblies dominated by people of wealth and high caste status – was established and ran until 1991. Nepali Congress, with strong Indian backing, agitated for and achieved the reestablishment of parliamentary democracy. This led to a period of economic and social chaos, in which the security forces were used to crush dissent. People who could not expect a career path within the Chettri-Brahmin sphere of influence were particularly marginalized, and this included a large number of young people for who the outside world was not a mystery and for whom education was not the path to employment. The civil war began in 1996, focused around the Communist Party of Nepal (Maoist). Its heartland was initially in the extremely poor North West of the country, and its impact was not initially much felt. The ideological basis, couched in the most obscurantist jargon, was extremely hard to understand. The movement was initially contained by the army, and its affects were not taken seriously. However, funding itself through collections and extortion, and although poorly armed, the increasingly determined movement spread across the highlands and began to infiltrate the cities. Mass strikes paralysed Kathmandu on a regular basis. The murder of the royal family in 2001 - and the consequent assumption of autocratic powers by King Gyanendra in 2004 - marked a turning point. Nepali people, having suffered greatly under the assumption that authority knew best, abruptly saw that authority in a new and unfavourable light. In 2006, popular agitation, alignment between the unions and the Maoists, urban infiltration and paralysis, a war in stalemate and foreign pressure forced the King to re-establish parliament. In 2007, parliament agreed to abolish the monarchy, and elections were called for 2008. Horrified by the prospect of further conflict, the population voted for what they saw was the party of peace: that is, not the Royalist-army alignment nor the current crop of politicians. Consequently, the Maoists won the election, the monarchy was duly abolished and Nepal became a federal democratic republic. Nepali Congress formed the chief opposition party, took the office of Presidency and with it, command over the army. This seemingly stable outcome became locked in stalemate over the fate of the former Maoist fighters. The Presidency, held by Nepali Congress, was able to block any attempts to integrate these with the army. After protracted recriminations, the Maoists stepped down from government and formed an majority opposition with other left-leaning groups. This configuration prevented most legislative activity and any progress towards a new constitution. The period after 2008 has been characterised by a continued stalemate. Public life and commerce have been characterised by scandals, criminality and the failure of many basic public services. Electricity and water are frequently interrupted, public sanitation is in crisis, health care is unaffordable, jobs are scarce and ill-paid, crime has increased and the capital is frequently brought to a standstill by strikes and political action. Politicians are seen to be squabbling over the prizes of office as much as principle, and there is no decisive leadership on offer. International interests - not least the Chinese and the Indians – are seen to be (and not infrequently exposed to be) heavily involved in interference and, allegedly, destabilisation. In summary: Nepal has felt like a nation only from the centre, looking outward. The governance of that centre has been uncertain or corrupt throughout almost all of its history. It has not engaged effectively with its neighbours or the outside world. Nepal is far more poor than it needs to be, chiefly because its elite has sought wealth through the slicing of existing cakes rather than the baking of new ones. Entrepreneurial spirit is not pronounced, and this shows in the weak degree to which Nepal has exploited its few natural advantages. Recent political history has reinforced these perceptions. Revolutionary groups – whether in 1959, 1991 or 2008 – have arrived on a torrent of rhetoric, and immediately embarked on a division of the spoils, world tours and divisive action. These scenarios are intended to provide a realistic map that Nepal may cross in its journey to 2020. The aim is to provide a set of markers that stand in for the political debate that should have been held. The Maoists can be criticised for being defined by what they are against, not what they are for. Nepali Congress has policies which can be similarly criticised for trying to hold onto past certainties rather than to embrace new potential. We are trying to inject a realistic, centrist voice of analysis and foresight. We hope that the scenarios will be taken in this spirit. Scenarios are paths across an imaginary map. Unlike the map of the world, drawn around the axes of North and South, East and West, these maps use the key variables that affect the prospects being studied. This section identifies our choices about this. Nepal has a number of important issues that could flip one way or the other, and in so doing greatly influence the outcome. Plainly, some of these are details, and some are structural, built into almost any detailed observation that one can make. 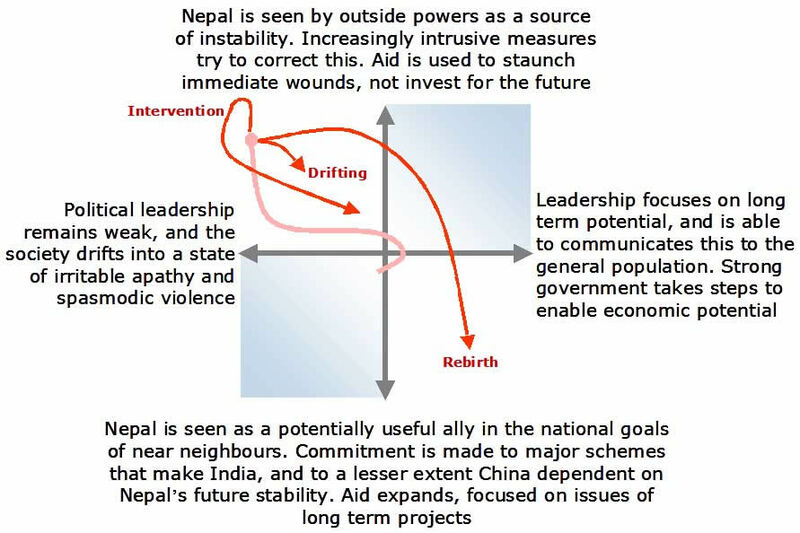 Figure 1 shows a range of highly structural variables that affect Nepal's future. Many are generic, in the sense that they affect almost any country. That does not make them less important to Nepal, however. The variables are clustered by coloured outlines. Primarily political factors are surrounded in green, the economic issues are bordered by blue and external perceptions by orange. These overlap. For example, external views of the country will greatly affected inward investment, the repatriation of funds earned overseas and the inward flow of aid. The political ethos and national sense of identity will have much to do with the presence of working institutions that propagate a sense of progress and equity. The orange and green sectors do, of course, have their overlap but this has been minimised, for clarity. How do societies find ways to collaborate? The answer is complex because it comes from many things, but chiefly from whether it pays the individual to do so. Two fundamental things stand in the way of this being true. The first is when the society contains a large number of disaffected people, or people whose life becomes worse when someone else enjoys an advantage. The second is the lack of institutions that make life predictable, safe and healthy, and which offer a way forward into a better life. If the vast majority of the citizens feel that they belong to something that makes their life better, and if they are in charge of at least a part of their destiny, then they are inclined to collaborate. If their world is predictable – if you work hard and save, if you are honest and trustworthy, then good things almost always happen to you – then this is how most people will tend to behave. If, by contrast, it is easier too steal someone else's crop than grow your own, then that is what people tend to do. In the end, nobody sows a crop, or starts a business, or saves or invests; and so the society goes into a decline. Perception is important, for if you believe one or the other of these things to be true, then this is how you will behave, irrespective of the reality of the situation. Perceptions tend to bring about the event. If enough people take a pessimistic view, then this enters into the outsider's view of the nation, and investment dries up, interest rates rise, currencies decline and the nation is in trouble. The future of Nepal is directly shaped by the blue box – by economic progress and the effectiveness of institutions in turning this into the basis of further growth. The blue box is, however, shaped by the green one: as it has been for last generation, by politics. Young people have never seen stability and healthy economic performance. They have never been exposed to healthy national political dissent. Many groups – ethnic and caste groups, people from the poorest regions – feel little or no solidarity with the nation and are bitterly resentful. The political class have a huge task of reconstruction and, above all, communication to put in place. All of this has been somewhat generic. Let us turn to Nepal as an economy. Figure 2 shows that this is dominated by agriculture. Government is, by comparison to other states, extremely small. 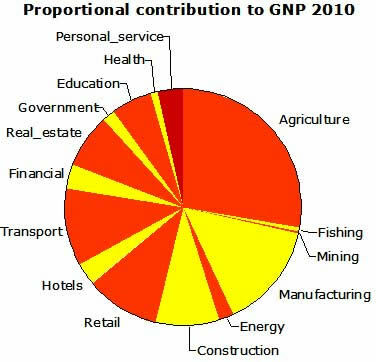 The state raises and spends around 5% of GNP. Imports (38% of GDP) greatly exceed exports (9.2%) and the current account balance is achieved through remittances and aid, the latter $424 million in a GNP of $1.3 billion. Much of the health, education and services in Figure 2 are delivered through NGOs, which are amongst the largest employers in the country. Unemployment is something of a meaningless figure in a country with limited social security: one earns, depends on one's family or does not eat. Perhaps half the adult population are, in these terms, "under-employed". Few who pass through the education system can be confident of using their new skills, which impels a significant proportion overseas to work, often in low skill jobs. Their remittances represent a substantial proportion of Nepal's overseas earnings, and the skills that they learn bring valuable lessons for the domestic economy if and when they return. Statistics are hard to come by for Nepal, despite decades of intense scrutiny by the aid community. One reason is that much of the economy is informal, proceeding by barter and exchange. The border with India is porous and many transactions are not recorded. Business accounting is often rudimentary and designed to under-estimate "for tax purposes". This means that life is probably better than the nominal $420 per annum would suggest, and a purchasing parity estimate suggests around $1200 as being more appropriate. Health and other indicators map more closely to the nominal than the PPP figure, however, and this is in part due to the extremely low state spending on these and related issues. The government raises little money and so is able to spend very little. The preceding section has laid out some factors that are important for Nepal's future. It may be helpful to recap. Nepal is critically dependent on the good will of both the international community and its two large neighbours. Indeed, the relations between those neighbours may have much to say to its future. The proportionately tiny state, and the chronic inability of its political class to deliver ideas-driven leadership has hampered Nepal. The state is unable to raise tax revenue effectively. It is therefore unable to undertake the huge range of tasks that are needed if the country is to develop rapidly. It has not been able to develop the strong institutions needed for commercial confidence, although the World Bank's indicator of "business friendliness" do put it ahead of India. The population have been greatly shaken by the events of the past decade and have largely lost confidence in political leadership of all shades. Ethnicity-based political demands is a new feature of the past few years. Indeed, significant groups have good reason to be alienated from the nation, and a counterbalancing national identity is weak. Monarchy, for all its faults, offered a focal point that is now entirely missing. There is no clear sense of national direction, and people often feel themselves drifting from bad to worse. The current economy does not appear to have any latent surprises built into it, either in respect of its current activities nor due from the entrepreneurial or technical talent of young educated individuals. There is not much "cake baking", and Nepali management style does not encourage junior staff to develop projects and idea. Unexploited potential remains significant, however: green energy and the resulting carbon credits from hydroelectricity, a renewed high-margin tourism and the potential to be derived from a possible transport connections between China and India. Traditional manufactured goods present transport and energy difficulties from most locations in Nepal. The "Swiss" answer for a hundred years ago was to hand-make clocks – exemplifying low mass, high added value products. There is a tradition of high quality craftsmanship, and much of Nepal's manufactured exports consist of hand-made goods. The potential for high value added crafts – individualised, made to order good, for example, is considerable. Equally, the "Himalayan" brand has not been exploited, with its potentially valuable associations of pure wilderness. Earlier, we spoke about the "map" that Nepal's potential futures must traverse. For example, a simple graph of a child's height over time shows a map of where he or she has come from, and an extrapolation shows where they may go. What are the variables that similarly capture Nepal's track over time? It is tempting to reach for the simple rate of economic growth as one such variable. However, this is not independent of other variables, and is not a good place to start. It is highly dependent on other things, and it is these which are fundamental to Nepal's future. There are many of these, but out task is to identify the most important of them. What might these be? The first of these is connected to or in some way summarises the coherence and confidence of the society. This includes its leadership, its self-image, the values that predominate in debate and the general cohesion of the society in the face of divisive issues of politics, ethnicity and geography. Nepal is currently in a social and political stalemate, a situation that could easily transform into a self-reinforcing spiral of decline. It could, however, also break out of this, certainly through the medium of inspirational political leadership, perhaps as a result of a social renaissance triggered in other ways. Such a move would take a position that accentuates the potential of the country to bake new cakes. It is a position which deals firmly with tax evasion, takes care that money is spent effectively and without undue favour to any one groups. It strives to bring the nation back together as an organic whole. The second has to do with the external situation in which Nepal finds itself. Relations with its neighbours are extremely important to it, particularly in the situation in which it begins to consolidate its position., Equally, its reputation with aid donors and others has a great impact. If it is seen as responsive to help, more will be given than if it is seen as an intransigent political muddle. External relations between China and India is of enormous importance to Nepal, as is the economic performance of both of these countries. General global issues are also of importance. For example, the cost of energy has potential to greatly damage a weak Nepal, and boost the economy of a nation that starts to exploit its indigenous resources. Figure 3 sets these axes against each other, showing the map across which Nepal is likely to travel. Naturally, there are other possibilities: we can only explore the influence of the primary variables and not take account of every possible accident or detail. The figure shows these two variables, reworded in rather more extreme terms than those given above. There are four boxes – "quadrants" that represent a particular combination of the two variables. 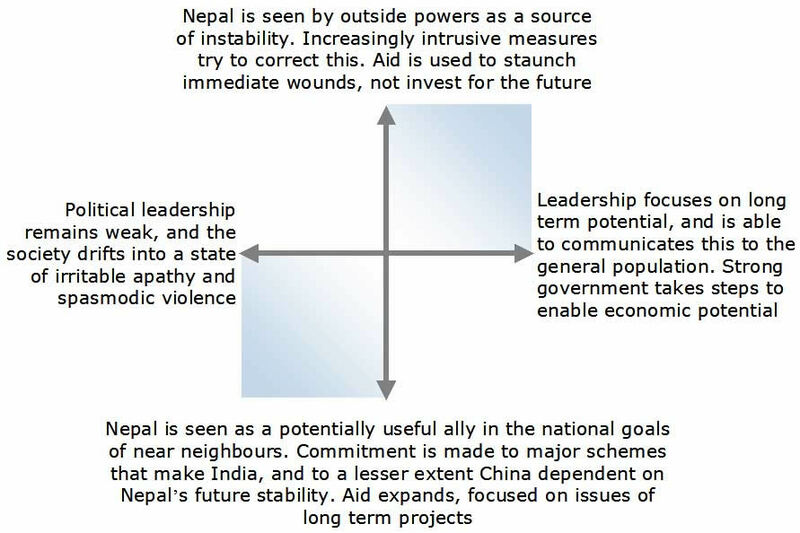 For example, in the upper left quadrant, we find the situation in which Nepal is seen to be unstable by outsiders, and in which political leadership is still weak. In the lower right, the opposite is true, for there is effective leadership, enthusiastic outsiders and investors. Clearly, some combinations are not stable when taken to extremes: if Nepal is badly led, outsiders will not have confidence in it. These areas are shaded a blue-gray colour. They are not viable: for example, the extremes of the lower left combines external applause with internal chaos, which will never occur. The white areas are, by contrast, viable combinations. Figure 4 repeats this diagram, but adds the path of Nepal's recent history to it. The solid red line tracks how the country has moved across the chart, with the dates marking the passing of each decade. The red dot, of course, marks the present. How is one to read this figure? In 1950, Nepal was seen as marginally more of a positive force than a risk by India, when it thought about Nepal at all. Leadership was not particularly strong, but not considered to be a major issue. The removal of the Ranas and the initiative towards democracy improved the view on leadership, but made the country potentially more of an issue, generating the track upwards and to the right in 1960. The re-establishment of authoritarian rule generated the slow drift to the left – to worse governance – but did not much affect Nepal's impact on its neighbours. Events after 1990 greatly accelerated the movement left across the figure. The sudden expansion of the Chinese and India economies, and the chaotic nature of Nepal's governance, made the country a strong negative issue for both of these, forcing the line up and left on the figure to where it stands in 2011. Plainly, there exists the high probability that Nepal will continue to drift. This would be shown as a vertical movement on the figure. This is, of course, the equivalent to the downward spiral of confidence and competence to which we have already referred. This is not a stable situation, however, as neither of its powerful neighbours can tolerate complete chaos in Nepal. Nepal is sandwiched between two of the fastest-growing potential superpowers of the next generation. India has difficulties with many secessionist groups and cannot tolerate a potential centre of diffusion on its frontier. China has similar, if less acute issues with Tibet. India will need Nepal's hydroelectricity potential, but cannot depend on a neighbour that may collapse at any time. It is extremely likely that both nations will come to an agreement about Nepal's future. Nepal as a failed state, perhaps jointly managed by its neighbours under a UN mandate would, unhappily, be the best that could be expected. A generation ago, annexation might have been the worst. Today, that might look more like enforced isolation and sealed borders, with the delivery of "welfare" quantities of fuels. However such issues were to be handled by the major powers, they would certainly be provoked to take some action by worsening crisis. It is in the interests of neither of them to permit a lasting state of chaos on a sensitive border. Consequently, the movement upwards on the figure is abruptly halted, and curved down (through greater political chaos) to a more stable and directed situation. This is labelled "Intervention" on the figure. Nepal might continue to drift, but with marginally more of a sense of direction and with the ability to keep the majority of the population content. Precisely how this is to be accomplished with an armed insurgent army in place is not clear, and this remains a low probability case. Nevertheless, the short arrow that represents this trend is labelled "Drifting". Third, and perhaps of equal improbability – but a future very well worth striving to achieve – we see the large arrow, arcing right and down across the chart: "Rebirth". This scenario represents the renaissance of inspirational political leadership. This is seen as of ambiguous importance by external powers during its early phase – hence the slightly rising trajectory. Once they are convinced of its reality, however, it dives deep into much more positive territory. What might be the economic drivers of Rebirth? We have discussed some of them above: engagement with neighbours to exploit Nepal's geography and resources. Tourism is capable of a renaissance, following the model of Bhutan in making access expensive and a subject of aspiration, rather than back-packer driven. Valley attractions would need to be separated from pollution and unplanned sprawl. One item of enormous economic potential is a major rail link between China and India. The trade between these, and the natural match as Chinese wages rise, makes this a very valuable piece of infrastructure. Nepal could reaping tolls from this, and could host numerous industries based on, for example, a tax free entrepôt. For this and other options to become possible, however, all parties would have to be satisfied that Nepal was stable and seriously led. The initial steps – those of sorting out the state, of bringing coherence to Nepal's fiscal policies, institutions and tax collection – would need to be carried out without such help. Such a change of emphasis seems foreign to the political establishment and such a leader would likely come from a nontraditional source. There are many Nepalis currently working overseas who have exactly this potential, but they individually lack a support base, organisation or funding. For Rebirth to occur, therefore, domestic Nepal needs to wake up to its potential – and to the potential for national shipwreck – in order to generate the grounds for such a leader to emerge. The absence of serious debate amongst the population stems from weak political traditions, poor education and the lack of a "language" in which to frame the issues. It would be a major act for an aid donor to fund the propagation of such ideas, perhaps through nontraditional media such as local radio, soap operas and the like. The Challenge Network supports the Trek Peru charity.